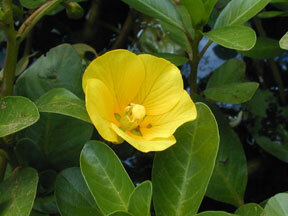 Also Called: Smooth water primrose, creeping water-primrose. Stems: Floating or creeping, rooting at nodes, 8 to 24 inches long, branched (particularly in land forms), glabrous to sparsely pubescent; flowering branches often ascending. Leaves: Alternate, oblong-elliptic, oblong-lanceolate, or oblong-spatulate, 1/2 to 4 inches long, .2 to 1.6 inches wide, glabrous or sparsely hairy; margins entire; tip rounded to pointed; base narrowed to flattened or winged stalk .1 to 1.6 inches long; stipules scale-like. Inflorescences: Solitary in upper leaf axils, showy; stalk .4 to 2.4 inches long. Flowers: Sepals 5, linear-lanceolate, 1/6 to 1/2 inch long, glabrous or hairy; petals 5, egg-shaped, 1/3 to 1 inch long, yellow, notched; stamens 10, to 1/4 inch long; stigma flattened, shallowly 5-lobed. Fruits: Capsule, cylindric, .4 to 1.6 inches long, to 1/6 inch in diameter, glabrous or sparsely hairy; seeds many. Habitat: Shallow water; margins of ponds, lakes and slow-flowing streams, ditches. Uses: The seeds are eaten by ducks.